Simply Adrift is a cozy town home in the heart of Manzanita and just four blocks to the beach. This wonderful three bedroom, two bath home comfortably sleeps four adults and four children for a total of eight. This attractive and comfortable home if perfect for a family with children, several couples, or a girls weekend getaway. The open foyer invites you in with natural light throughout the cozy living room. With plush furnishings, a gas fireplace and 50” flat screen smart TV with cable and DVD player you will never want to leave. An assortment of movies and board games will keep everyone entertained. The large kitchen is perfect for preparing a fantastic meal and is fully stocked with all amenities, including ample cupboard and counter space! There's room for six people at the dining table and three more at the bar. Open the double French doors to the small enclosed patio off the living room to bring the outside in. Enjoy the gas barbeque and outdoor seating while entertaining friends and family. The master bedroom is on the main level with king bed and very comfortable mattress. The bathroom near-by has a glass enclosed tub and shower and right next to the bathroom is a stacking washer and dryer. Make your way up the open staircase to find two bedrooms, one with a queen bed and the other with double bunk beds. There is a spacious loft which acts as a second living room with 50" flat screen TV with DVD player which makes a is great spot for kids or teens to call their own. In the hall is another full bathroom with a glass enclosed tub and shower. Last but not least, the garage is open for storing the toys you bring with you. We provide beach chairs and sand toys. Simply Adrift allows one small, well behaved dog. No Smoking of any kind on or in the property. Max occupancy is 8. We ask no more than 6 adults. 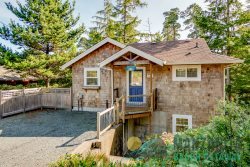 Steps to downtown Manzanita and less than five minute walk to the beach. Loved the fully stocked kitchen and amenities. It was great not to have to think about all the small things, even for a quick getaway! MESSAGE FROM MANZANITA BEACH GETAWAY: We welcomed Simply Adrift to the MBG family August of 2018, stay tuned for more reviews to come!